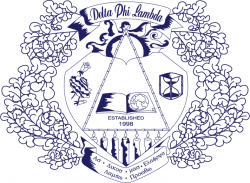 About Us - GVSU Delta Phi Lambda Sorority, Inc.
​Delta Phi Lambda Sorority, Inc. is a 501(c)(7) non-profit organization that advocates Asian awareness and empowers women to lead through values-based programs and everlasting sisterhood. Delta Phi Lambda’s national philanthropy is osteoporosis education and prevention, emphasizing the importance of promoting healthy lifestyles and behavior in young women. Founded in 1998, Delta Phi Lambda Sorority, Inc. has grown to 19 undergraduate chapters in 11 states spanning the Southeast, Midwest, and the Northeast. Motto: "Let Our Light Shine Forth." We, the sisters of Delta Phi Lambda, pledge to wholly dedicate our mind, body, and spirit to the completion of our mission. We will seek to improve the image of the Asian American. We will achieve this by acknowledging and spreading our unique Asian heritage. The bond between the sisters will set an example for others in the Asian community. We will set this example by displaying the virtues of loyalty, honesty, respect, dedication, integrity, discipline, and academic excellence. We hold these virtues to be true and will execute them in every venture the sorority will undertake. Delta Phi Lambda will remain strong through unity, and our legacy will live on through the works of the sisters. "Delta Phi Lambda will be the sorority that is recognized by universities and among the greater fraternal community for its progressive initiatives that aim to develop women into strong, independent leaders."